The hardest thing to do when building a team is to identify whether the young player you have on your team is a star or a Superstar. The difference can appear to be difficult to grasp on the surface, but put simply a star is someone who will put up numbers and make All-Star teams, while a Superstar is a player whose mere presence on a roster (when surrounded by league average talent) automatically elevates that team to a legitimate contender to win a championship. 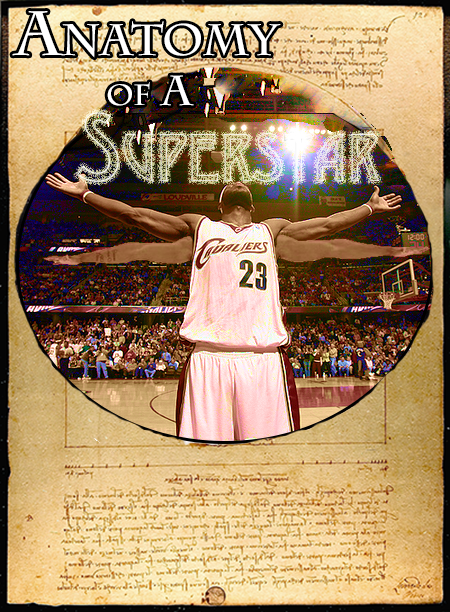 LaMarcus Aldridge is a star, LeBron James is a superstar. So how can you tell if a young player is going to be a star or superstar? 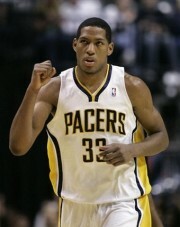 Danny Granger, at 25 in only his fourth season put up 25.7 ppg, 5.0 rpg, 1.0 spg and 1.4 bpg. He was going to be the young cornerstone of the post Reggie Miller Pacers, and would only get better as he matured. That 2008-09 season by Granger was far and away the best of his career, as his points per game and shooting percentage have gone down every year since. With this precedent in mind, I attempted to try to find some statistical hint into the difference between a star and a superstar during the first five years in their careers. To do so, the players are divided into two groups. The best way to approach this kind of comparison is to compare all of the players by position. Right now in the NBA, led by LeBron James and Kevin Durant. the glamour position is Small Forward so that is an apt place to start. Two things immediately stand out. First of all, look at the discrepancy in points scored in the players rookie year. The Superstars averaged 19.60 ppg their rookie year, more than double the puny total of the All-Stars, who pitched in 8.16 ppg. This can likely be attributed to the superfluous amount of athleticism needed to succeed at small forward, meaning the adjustment period should be quick. The second thing that jumps out is the peak for the superstars. 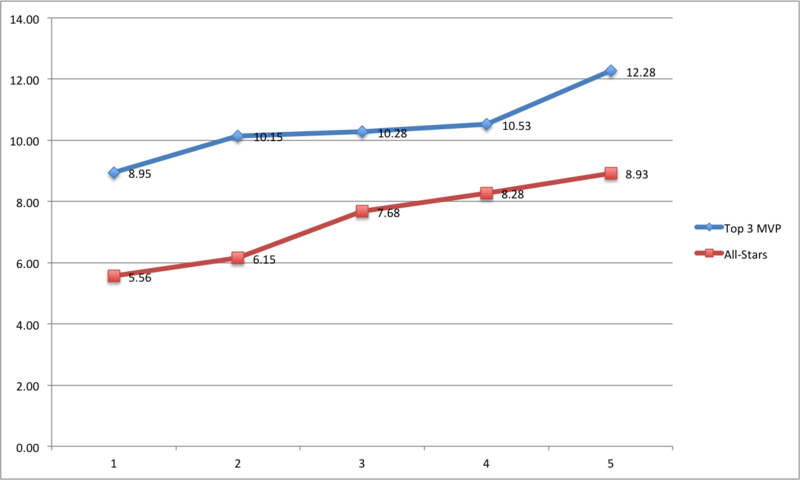 As you can see above, the Superstars reach their apex in season three, and after that level off. Superstars are so talented that they quickly reach their apex (at least when it comes to scoring), and then level off and get better at the nuances of the game. From years 1-3, the average Superstar increased their scoring input by 8.73 ppg while the average All-Star only increased their scoring by 6.99 ppg. However, if you go from looking at scoring output between years 1 and 3 and look at years 1 through 5, the All-Stars are the ones who shine. They gain 10.53 ppg over their first five years in the league while the Superstars only gain 7.80 ppg over that span. The All-Stars need the extra years in the league to refine their games, as they do not have the raw talent and athleticism to just score at will. They have to learn how to score. So with points out of the way, it is time to move on to some other stats. Since the best Small Forwards exhibit an all-around game, instead of looking at rebounds and assists separately they will be added together. Pretty similar trajectory for the two groups, only the Superstars begin (and end) approximately 3 REB + AST higher than the All-Stars. So pretty much if you are a superstar, you begin putting up a lot of Boards and Dimes, and slowly get better over time. If you are an All-Star, you start at a pretty mediocre number and steady increase the stats over time, cumulating after 5 years with the All-Stars numbers matching the total of the Superstars freshman year. So we have the guidelines for what has occurred for past players and how to see if they are superstars. Well, what about the current crop of up-and-coming players? Let’s examine all notable small forwards in year 3 or below. This will consist of third year players Paul George and Gordon Hayward, second year players Kwahi Leonard and Chandler Parsons, and rookies Michael Kidd-Gilchrist and Harrison Barnes. Well Golden State and Charlotte, the good news is that MKG and Barnes look like they could develop into solid NBA All-Stars one day. The bad news is they are probably not going to be superstars. Again, both players look to be All-Stars, but neither are Superstars. 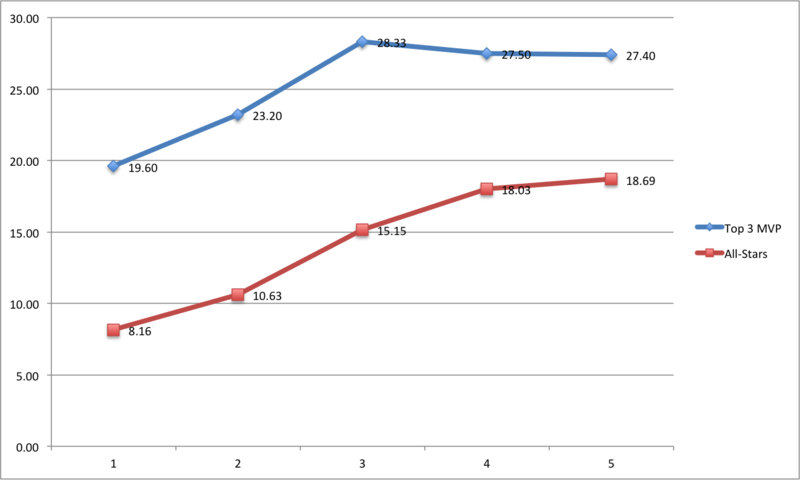 Very similar, and even more so when you consider Iguodala’s better rookie year is mostly due to the fact that he played 32.8 mpg to George’s 20.7. Being Iguodala 2.0 is nothing to sneeze at, because if he is the second or third best player on your team that team is a championship contender. However, if he is your best player, you might be in trouble. So at this point, it does not appear as if there is a worth young challenger in the NBA ready to grab the Small Forward throne from King James. While youngsters like Michael Kidd-Gilchrist, Chandler Parsons and Paul George might get themselves a few All-Star berths during their career, based on the path drawn by their predecessors it is unlikely they will ever be able to carry a team and the label of Superstar. Do you think Paul George is a Superstar?